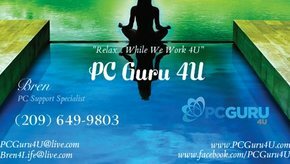 PC Guru 4U offers a wide variety of computer, small business, internet and marketing services. As your Virtual Assistant, we will handle any of those administrative tasks you just don't have time for anymore while running your business. 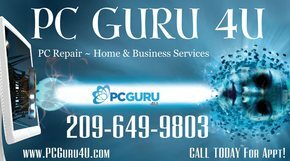 We can repair, upgrade, clean and build your PC as well as troubleshoot most PC issues, set up a network, configure your system for optimum performance, install software and even set up managing a database for your mailing list or inventory. Our marketing services include social media integration, web page creation and maintenance, networking and building up an online presence for your business. Additionally, we will design your logo, create business cards, flyers, brochures and any other promotional work you may need and advise you on current internet marketing strategies and advertising. For our personal clients, we offer very reasonable rates for tax preparation and resumes and we can even help you search for employment online as well as funding for college and most any kind of research you want. 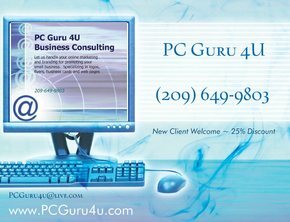 PC Guru is an established seller on eBay and Craigslist, so if you are looking to list items for sale online, we can do that too! Background checks are also available. Whatever you need help with... You will find us to be capable and competent with over 25 years of experience in customer service, business administration and management, sales, desktop publishing and document control - And over 15 years experience with computers, the internet and networking. 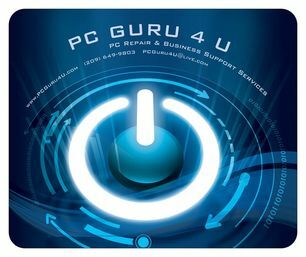 Don't hesitate -- Call PC Guru 4U for a free estimate today! Data recovery & Data transfers. Business cards, Brochures, Flyers, Forms, Internet sales, Online marketing/promo, Background checks, Web page creation, Web site maintenance, Customer service support, Accounts management, Billing, Accounts receivable, Database set-up, Social media pages & Correspondence. Professional resumes (online & in print), Income tax preparation, Online research, College funding, Forms completion & submission, Social media networking, Blogging, People locates, Background checks, Writing & editing, Digital photo services, Various online & other services.